May 5, 2007: Cloudy and Cool, Water temp 67* and Clear. Started the day off at 6am with 50 Gizzards and some nice Herring. Set up pulling a bank with planner boards, running depths from 5 to 25 feet. The first 5 or 6 bites came on the bank on Gizzards with no hits on the outer boards. We then pulled a midlake ridge in 20 foot of water running boards and downlines . The fish were stacked up on top of the ridge and we would get strikes on every pass. 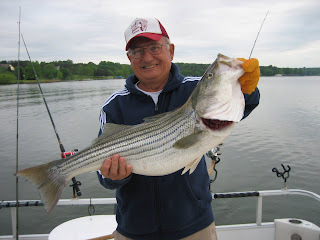 We caught the smaller fish on Herring and the larger Stripers on big Gizz. George caught a 14.5 pounder off a Water Bugz board in 6 feet of water. 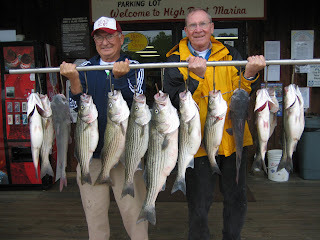 Clients caught 14 Stripers and 3 Cats, keeping 12 Stripers and 2 of the larger Catfish.